Are you dreading the thought of starting the car buying process? At LeBrun Toyota, we will provide you with your own Personal Auto Shopper to help you from start to finish. We are located 18 miles from Geneva, making it a convenient trip that will not take all day! Whether you’re in the market for a new Toyota RAV4, Highlander, Tacoma, Corolla, Certified Pre-Owned car or a used car in Geneva, NY, we are sure to have a match for you. Browse through our inventory today and check out the other amenities we have to offer! Follow our directions directly to the dealership, complete our contact form below or give us a call to receive more information or schedule a test drive. 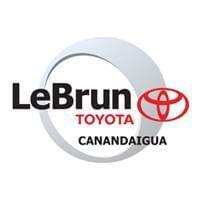 LeBrun Toyota looks forward to serving all Toyota drivers from Geneva!